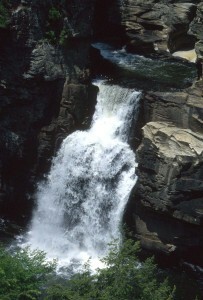 The Linville Falls area is located in the heart of the Blue Ridge Mountains at Parkway Milepost 316.4. The Linville is a wild and scenic river and the massive gorge it has created is home to a variety of plants and animals. These extensive lands, which for the most part are undisturbed by humans, are home to a variety of animals including turkey, fox, raccoon, black bear, deer, and a host of birds. The river also houses several different species of trout. 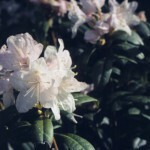 Many rare plants, as well as more common varieties, are located in the area. The landscape is particularly beautiful as the leaves change in the fall and as the flowers bloom throughout the spring and into the summer. 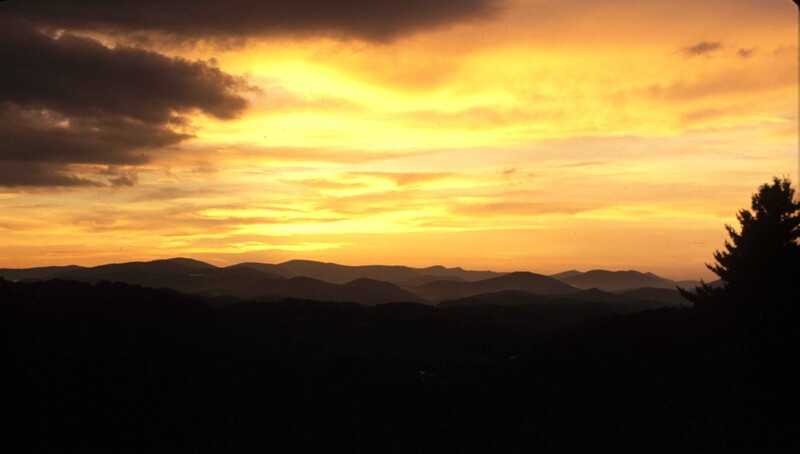 This 1,200-acre site is part of the National Park system and the Blue Ridge Parkway. It includes three trails that wind through the gorge and atop the cliffs where two cascading waterfalls can be viewed from several vantage points. 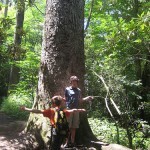 Hiking trails range from easy to strenuous. All offer breathtaking views of the landscape as well as many rare and beautiful plants. 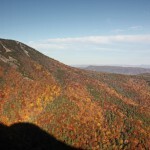 The falls are bordered between Jonas Ridge to the east and Linville Mountain to the west. The Linville River descends some 1,800 feet over twelve miles in a series of drops, eventually emptying into Lake James. 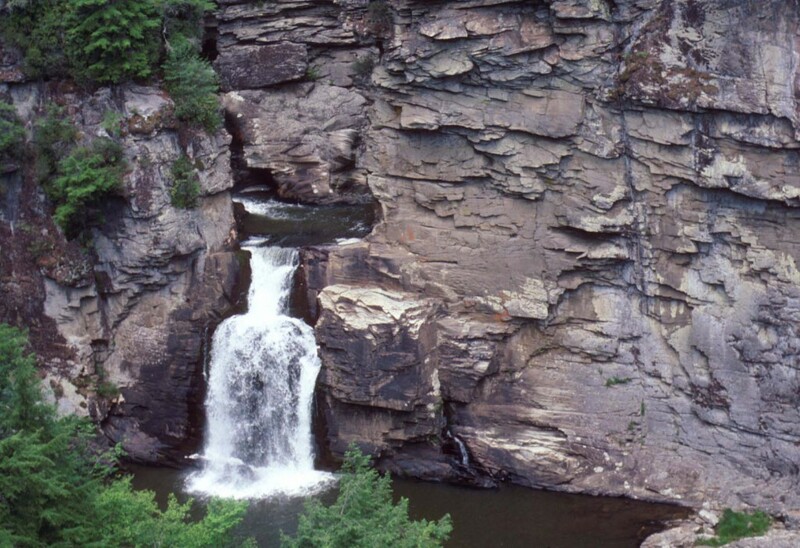 The first known inhabitants of the Linville Falls area were the Cherokee Indians who named it Ees-ee-ogh meaning “River of Cliffs.” They hunted game such as deer, squirrel, and rabbits, and gathered nuts and berries in the spring and summer months. These native inhabitants also found an abundance of fish in the Linville River. Mica found in the area was used by the Cherokee for tools as well as for trade with distant tribes who had no sources of mica available. Due to hard winters and rocky terrain, the Linville Falls area served primarily as a seasonal camp for the Cherokee. During the winter months, they relocated to the less-rugged river valleys. The Spanish explorer Hernando DeSoto journeyed through this part of North Carolina around 1545. Other Spaniards, including Juan Pardo, also explored Western North Carolina for mineral wealth but all failed in their quest to find gold and other riches. With their departure, the region was neglected by Europeans for over a century. By the middle of the 1700s tensions were increasing between the Cherokee and newly-arrived settlers the British Isles and Germany. In 1766, these tensions turned to bloodshed. William Linville, along with his son John and their servant, John Williams, were hunting and exploring the river. While camping near the lower falls, the party was attacked by several Cherokee hunters. Linville and his son died in the attack. Williams escaped to tell the others, and the River and the Falls have since held the name of Linville to honor the fallen man and his son. During the 1777 Cherokee War, Colonel Waightstill Avery and General Griffith Rutherford drove out the remaining native inhabitants. A decade later Avery took title to the Falls region and eventually passed the land down to his descendants. Unlike the transient Spanish explorers, later European arrivals intended to stay. 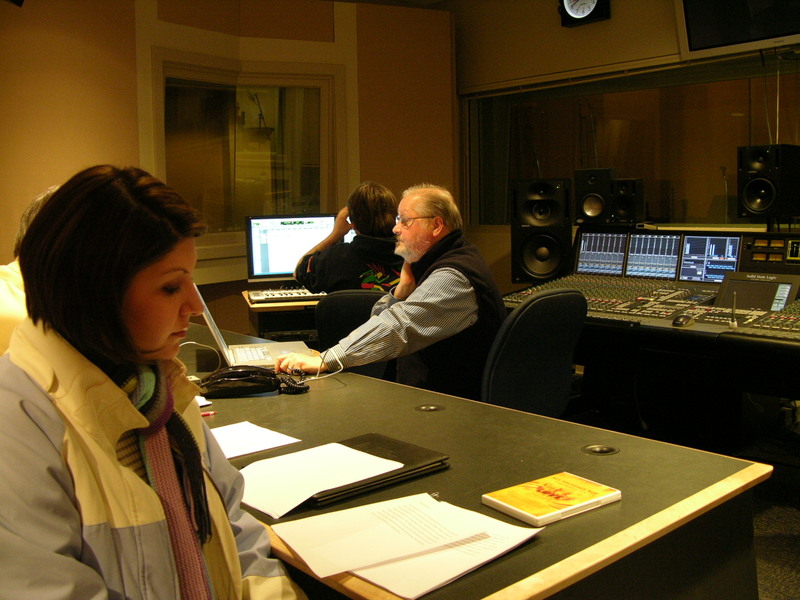 During the eighteenth century, thousands of Sotch-Irish, Germans, and English settled in the western Piedmont and the mountains of North Carolina. During the Civil War, this area was home to an iron forge, situated upstream from the falls. Confederates were able to extract iron at the nearby Cranberry Mines. The forge was used to process iron into steel for use in a small rifle manufacturing operation. These Confederate enterprises came to a quick end when Union forces entered the area and siezed the equipment. Along with the forge and rifle plant, there were also a series of small shacks used by the men who operated these enterprises. Mining companies and large-scale logging made the area around Linville Falls attractive to railroad companies. The Western North Carolina Railroad line was completed in the late 1890s. Logs were floated down the lower portion of the Linville River and then transported by rail to distant markets. Among these minerals found in the area were iron, mica, and lead – the latter sometimes used by hunters to forge bullets. The land surrounding Linville Falls has changed hands many times and ownership is questionable during some periods. Unfortunately, many land records were lost when the Burke County Courthouse in Morganton burned in 1864. After the Civil War, the land around the falls was sold to David Franklin for back taxes. Allegedly, Franklin found the land unsuitable for farming so he traded his holdings for a new suit of clothes. The last private owner, F.W. Hossfield, realized the area’s scenic attraction and began to charge tourists a fee to view the falls. Finally, in 1952, at the urging of local residents, philanthropist John D. Rockefeller, Jr. purchased the land. Mr. Rockefeller then donated the tract of land to the State of North Carolina. The state later turned the land over to the federal government, and it was split into two parcels. The upper portion, including the falls, is managed by the National Park Service as part of the Blue Ridge Parkway. 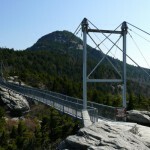 The lower portion was designated a wilderness area in 1964 and remains under the management of the United States Forest Service (USFS) as the Linville Gorge Wilderness Area. 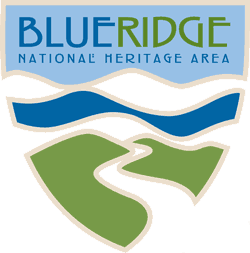 The Blue Ridge Parkway was completed in 1987 with the construction of the Linn Cove viaduct around Grandfather Mountain. 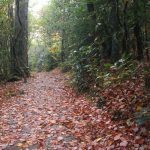 The Parkway was designed to offer visitors a scenic drive through the Blue ridge Mountains from the Great Smoky Mountains National Park to Shenadndoah National Park in virginia. It soon proved to be a popular tourist destination. Proximity to popular mountain destinations as well as various recreational opportunities continues to draw tourists to the area. Today, Linville Falls is a major attraction in the Blue Ridge Mountains, drawing visitors from all parts of the United States and around the world.